BASF announces that it has developed a sustainable snack packaging that can help companies and communities get closer to their goals of zero-waste. The prototype packaging debuted on September, when the US Major League Baseball team Seattle Mariners took on the Boston Red Sox. The first 10,000 audience received a free bag of peanuts in a 100% compostable snack bag based on BASF’s biopolymer technology. 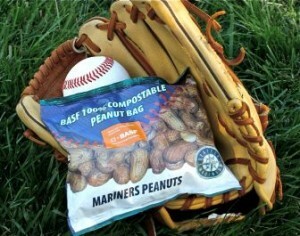 According to BASF, the Seattle Mariners is on track to divert 85% of its waste from landfills, up from just 12% in 2006. However, its goal of 90% diversion has been an elusive goal. “All of our service ware is already compostable, but snack food bags have been one of the biggest barriers preventing us from getting to our goal. Flexible packaging made with BASF biopolymers could represent the holy grail of greening for our waste stream.” Mariners VP of Operations, Scott Jenkins, said. “Whenever there are contaminants in our compost stream, like regular snack bags and candy wrappers, we have to pay a premium to have them removed by hand. If all of the snacks sold at Safeco came in compostable packaging, it would represent a significant savings of time and money for the team and get us a whole lot closer to achieving zero waste.” He added. The city of Seattle also welcomes this technology as it represents a more convenient alternative towards green initiatives. “We welcome technological advances like this that inspire our entire society to move toward sustainability and help municipalities like the City of Seattle divert more waste than ever away from landfills.” said Brett Stav, Seattle Public Utilities, Senior Planning & Development Specialist.